Last May 2, Trillanes and Duterte’s camp face each other at Bank of the Philippine Islands-Julia Vargas branch but their meeting did not end up good cause Duterte’s lawyer doesn’t have a waiver to open his client’s account. With this, Trillanes called the presidentiable candidate a coward. They are supposed to open Duterte’s bank account to prove if Trillanes’ allegations of the mayor’s hidden wealth were true. The senator recently revealed on a presscon that the front runner for president has an alleged wealth with an amount of Php2.4 billion. He got the documents to Joseph De Mesa whom he said was a former supporter of Duterte. He revealed that he met De Mesa at Magdalo Office last April 21 where he gave the bank documents of Duterte and his daughter Sara’s accounts. The tough talking mayor on the other hand slammed Trillanes allegations and his camp called it non-existent. He even dared him to sign a waiver where he got the sources of his allegations. Sen. Antonio Trillanes was accompanied by his lawyer while Atty. Salvador Panelo went without the mayor. Meanwhile, Atty. Panelo said that the BPI branch confirmed that Duterte do not have a Php211 million account but the bank told him to wait for 4 to 7 days for them to decide whether they will release an official certificate. He brought with him 2 documents. 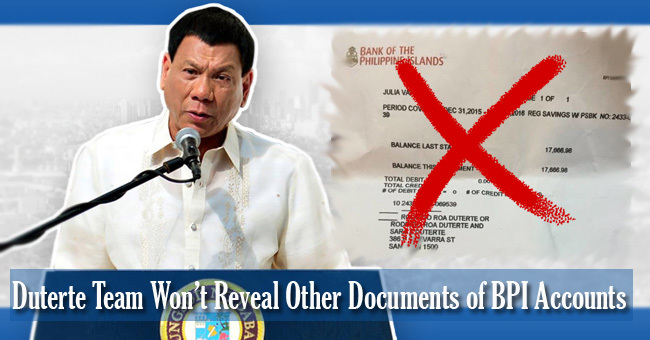 The 1st one is a Special Power of Attorney with Duterte’s signature to allow him to look for his account and a request for the bank to release a certification that his client did not deposit Php211 million. He also revealed that Duterte requested the bank to confirm or deny if he had deposited that kind of amount. BPI will take a long time to release a certification cause their request was not ordinary. He also revealed that the officials of BPI denied that the documents Trillanes had were theirs.